by Echevarria, Jana; Vogt, MaryEllen; Short, Deborah J. In this comprehensive guide, elementary educators get a user-friendly approach for planning and implementing lessons that provide students access to grade-level content, develop students’ academic English skills, and prepare students to be college- and career-ready. 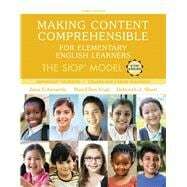 Proven successful in improving teaching effectiveness and realizing academic gains for students, the SIOP Model presented in this book can be implemented in all content areas, and across grade levels and English proficiency levels. Highlights of the 3rd Edition include specific applications of SIOP to Common Core and other state standards, as well as new educational reforms such as ESSA. To help teachers implement the SIOP model, new learning aids have been added, including Reflect and Apply exercises, Teaching with Technology vignettes, a new SIOP lesson plan template and sample lesson plan, and a new user-friendly approach to identifying and writing language objectives. The Enhanced Pearson eText version provides embedded video links that enable students to see the SIOP model in action, along with interviews featuring SIOP educators. Jana Echevarría, PhD, is Professor Emerita at California State University, Long Beach where she was selected as Outstanding Professor. She has taught in general education, special education, ESL, and bilingual programs in U.S. schools, and has lived and worked in Taiwan, Mexico, Spain, and in Macedonia where she was a Fulbright Specialist. Her research and publications focus on effective instruction for English learners, including those with learning disabilities. She has presented her research across the United States and internationally including Oxford University (England), Wits University (South Africa), Harvard University (United States), Stanford University (United States), University of Barcelona (Spain) and South East Europe University (Macedonia). A founding researcher of the SIOP Model, her publications include more than 60 books, book chapters and journal articles. Currently she serves as the EL expert for the U.S. Department of Justice on the Lau case. Her blog is found at www.janaechevarria.com. MaryEllen Vogt, EdD, is Professor Emerita of Education at California State University, Long Beach. Dr. Vogt, a former classroom teacher, reading specialist, curriculum coordinator, and teacher educator, received her doctorate from the University of California, Berkeley. She is an author of numerous articles and chapters, and is co-author of seventeen books for teachers and administrators, including Professional Learning in Action: An Inquiry Approach for Teachers of Learning (Risko & Vogt, 2016). Her research interests include improving comprehension in the content areas, teacher change and development, and content literacy and language acquisition for English learners. Dr. Vogt has provided professional development in all fifty states and in several countries, including Germany, where she served as a Visiting Scholar at the University of Cologne. She was inducted into the California Reading Hall of Fame, received her university’s Distinguished Faculty Teaching Award, and served as President of the International Reading Association. Deborah J. Short, PhD, founded and directs Academic Language Research & Training, a consulting company, and provides professional development on sheltered instruction, content-based language teaching, and academic literacy worldwide. Formerly she was a Division Director at the Center for Applied Linguistics, Washington, DC, where she co-developed the SIOP Model and directed quasi-experimental and experimental studies on English learners funded by the Carnegie Corporation of New York, Rockefeller Foundation, and U.S. Department of Education, among others. Her publications include journal articles, the SIOP® Model book series, and several ESL textbook series for National Geographic/Cengage. She taught English as a second/foreign language in New York, California, Virginia, and the Democratic Republic of the Congo. She has served on the Board of Directors of the TESOL International Association and has presented research in the United States, Canada, New Zealand, Brazil, Colombia, Europe, and the Middle East.